Pittsburgh Penguins Defense: Who Are These Kids? Who Exactly Is Playing Defense for the Pittsburgh Penguins? Entering the 2013-14 season, the Pittsburgh Penguins had a “problem” of sorts on defense. The problem was that they had too many talented, NHL-ready players. Back in September, there was a logjam on the blue line that already featured seven defensemen on one-way contracts who had played a combined 2,801 games. Even when Kris Letang suffered an injury during the preseason, 19-year-old rookie Olli Maatta was ready to step up into a regular NHL role with impressive poise and skill. The conversation quickly turned into whether Maatta was too good to be sent back down to juniors (definitely too good), and which defenseman should inevitably be traded to create cap space and an open roster spot (Niskanen was the popular pick). General Manager Ray Shero let it play out though. Kris Letang returned to the lineup. Then Rob Scuderi broke his ankle. Then Paul Martin suffered a fractured tibia. Then Brooks Orpik left a game with a concussion. 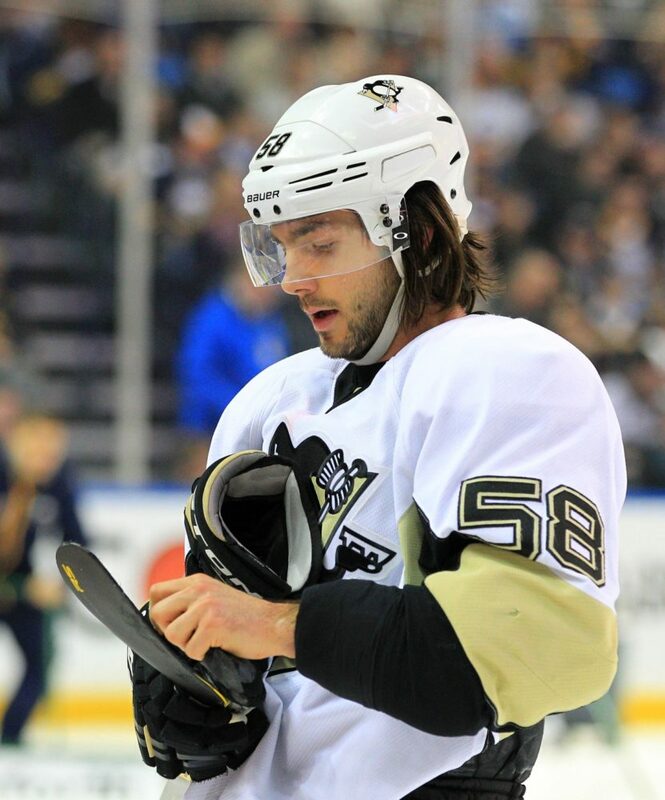 Then Kris Letang left the lineup again with an upper body injury. Then Deryk Engelland was ejected from a game and suspended. Many around the NHL, and even in Pittsburgh, are now wondering who is playing defense for this team? Take away Niskanen and there was a solid 134 games of combined experience between five defensemen. Despite the inexperience, the young group held strong against Toronto and allowed just 26 shots against goaltender Marc-Andre Fleury in a 3-1 victory. As these kids (average age of 22.67) continue to propel the Penguins to victory, it’s time to take a look at who they are and where they came from. The oldest of the group at the age of 27 is Matt Niskanen. Niskanen has already faced a lifetime of being underappreciated throughout his young career. Many remember him as the “throw-in” with James Neal in the deal that sent Alex Goligoski to Dallas in 2011. He shed the “throw-in” label over two full seasons with the Penguins as he bounced between the 2nd and 3rd pairs and often stepped up on the powerplay when others were injured. Entering this season, most people saw Niskanen as an unnecessary luxury. Making $2.5 million ($2.3 mil. cap hit) with an expiring contract after this season, it appeared that Niskanen wouldn’t be necessary on a team with defensive prospects for miles. The injury to Kris Letang in the preseason may have changed Matt Niskanen’s career path though. Niskanen stepped up into a pairing with Rob Scuderi (while he was healthy) and played far above anyone’s expectations. He’s on pace for his best season as a Penguin, currently with 13 points in 35 games and a +18 rating. Suddenly, the “throw-in” and the trading piece is the top defenseman on the team. The 22nd pick overall in the 2012 draft wasn’t supposed to make the NHL this year. After all, he was just a 19-year-old with junior eligibility; his debut was supposed to be saved for next year. After two years in the OHL with the London Knights though, Maatta arrived in training camp this season demonstrating good poise, awareness, and natural skills. The Penguins decided to keep him for a nine-game tryout and the rest, as they say, is history (well, recent history). Maatta’s ability to handle big minutes and his understanding of the game have catapulted him to the top pairing in the wake of injuries and suspensions. On Monday night, he played a career-high 24:17 and led the team with 6:12 of shorthanded ice time. All of a sudden, the 19-year-old is a veteran. As the 30th overall pick in the 2009 draft, Simon Despres has already flip-flopped between promising young defenseman, to possible bust, back to promising young defenseman in the organization. He made his NHL debut with the Penguins in the Fall of 2011 and had played 51 NHL games heading into this season. One of the major reasons he struggled to stay in the NHL was because of his waiver status – Despres has often been the only defenseman on the NHL roster who didn’t have to clear waivers. His issues went beyond that though. Sometimes (and perhaps incorrectly) labelled as distracted or lazy, everyone wanted to see more consistency from Despres. He started this season with the AHL’s Wilkes-Barre/Scranton Penguins after Dan Bylsma had called him a Top-4 NHL defenseman just a couple of months beforehand. It was certainly a setback. The setback did not last long though as Despres was called up due to injuries and has made the most of his opportunities thus far. Any lingering questions about his work ethic and abilities have disappeared during his current 10-game stint, during which he has frequently been the team’s most consistent defenseman. He also finds himself next to a close friend now. After taking Despres in the 1st round of the 2009 draft, the Penguins took defenseman Philip Samuelsson with their next pick, 61st overall in the second round. Philip, the son of former Penguins defenseman Ulf Samuelsson, took a longer career path to the NHL than Despres. He started off at Boston College for two years, then continued on to Wilkes-Barre/Scranton, and finally made his NHL debut on Monday night with his proud father watching. As Chris Adamski of the Tribune-Review detailed, Samuelsson and Despres have become good friends on their journey to the NHL. They formed a pairing in the AHL, and now are unexpectedly doing the same in the NHL. Samuelsson is known as a physical, shut-down defenseman who can handle penalty-killing minutes. As his father described him, “He’s a modernized version of what I was,” and that’s exactly what the Penguins will need to survive their current injuries. When the Penguins traded Jordan Staal to the Carolina Hurricanes on draft day 2012 in Pittsburgh, Brian Dumoulin was generally the least talked about piece of the return package. Ray Shero brought back center Brandon Sutter, the 8th overall pick in the draft (Derrick Pouliot), and Dumoulin for Staal. It was easy to understand Sutter, the man stepping into Staal’s lineup spot. It was easy to understand a 1st-round pick, always a valuable commodity. But where did Dumoulin fit in with an organization that drafts defenseman at every possible opportunity? 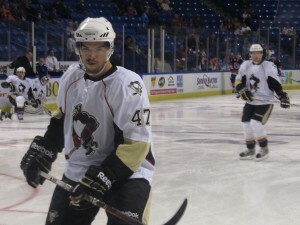 Dumoulin was yet another product of the 2009 draft, the 51st overall pick for Carolina. He also took a similar path to Samuelsson’s, playing at Boston College for three years and then moving on to Wlikes-Barre/Scranton. As Dumoulin steps up now to fill several voids, including playing 2:12 on the penalty kill in his NHL debut on Saturday and joining the top powerplay in only his second NHL game on Monday, it looks like the Penguins have officially “won” the Jordan Staal trade. Finally there is Robert Bortuzzo. The 24-year-old has taken the longest path to the NHL of these six, which isn’t saying much. He was taken by Pittsburgh in the 3rd round of the 2007 draft, 71st overall. After some time in the OHL with the Kitchener Rangers, Bortuzzo spent 3+ season with the Wilkes-Barre/Scranton Penguins before moving into a 6th/7th defenseman role with Pittsburgh in the 2013 season. Bortuzzo’s limited NHL time has been somewhat frustrating. He has been trapped behind several veterans on the depth chart, but “stuck” in the NHL because the team did not want to put him on waivers. His situation even lent itself to the idea that he could become a trade piece. A few injuries later, Bortuzzo is a vital part of the defense for now. He played the role of fighter, pest, and penalty-killer to perfection against Toronto and will continue to bring size and toughness to a young, inexperienced blue line. In just two short months, Bortuzzo has gone from the 2nd youngest of the group to the 2nd oldest of the group. With a little luck, a lot of skill, and the benefit of being in the Metropolitan Division, it looks like this group of young kids will do just fine for the Penguins as they wait for their veterans to return. It’s time to sit back and watch them grow before our eyes.